It’s officially fall and here in the northeast, it’s getting chilly and rainy. There’s nothing I love more on a cold, rainy day than cozying up with my family and a warm bowl of soup. 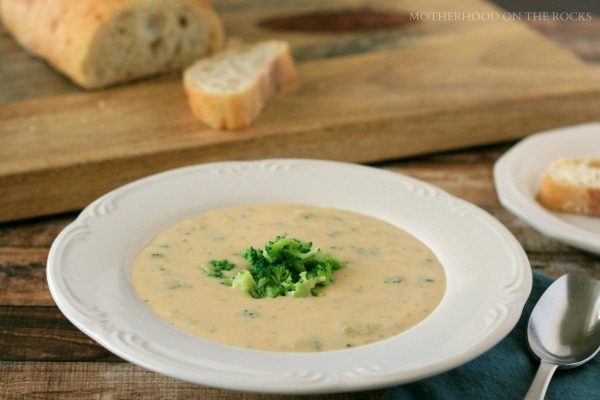 One of our family favorites is bacon broccoli cheddar soup. Because…bacon. It’s so creamy and cheesy that even your kids will eat it without complaint. Eating veggies without a battle? Score! And bonus: You can whip it up in a snap. Simply pair with some crusty bread and glass of wine and you’ll feel like you’re having a gourmet meal out. Without further ado, the recipe is below. If you try it, I’d love to hear what you think, so come back and let me know! This looks like the perfect recipe for Fall. Adding this to my recipe bookmarks!